Steve McGuire’s Fabrication and Design: Hand Built Bicycle class presents a unique opportunity for students to master skills that are not part of many other classroom experiences. Since the class started five years ago, more than 70 students have built bicycles, and seven have gone on to be engineers and craftspeople in the bicycle industry, he says. The class is helping put UI on the map in a new and unique way. Photo by Tim Schoon. For the third consecutive year, the University of Iowa will be the only academic institution exhibiting student work at the North American Handmade Bike Show. NAHBS, to be held in Sacramento this year, from Feb. 25–28, is considered the most prestigious handmade bicycle show in the world. The class presents each student with the opportunity to create an aesthetic and functional piece of equipment from start to finish. Photo by Tim Schoon. 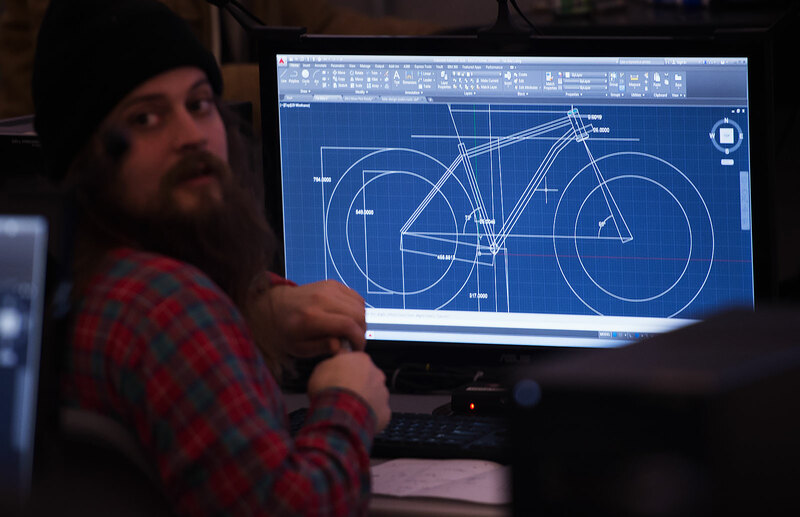 The students building bikes for this year’s show include five from engineering and five from studio arts, who are all enrolled in professor Steve McGuire’s Fabrication and Design: Hand Built Bicycle class. The students and their bikes will attend the show, along with engineering and studio arts faculty advisers, including McGuire. This is a chance to not only display their own bikes but to rub elbows with the world’s premier bicycle builders. McGuire, an avid cyclist, created the curriculum for the class in 2010 to foster collaboration between the College of Engineering and the School of Art and Art History and to unify the four artistic disciplines of sculpture, ceramics, jewelry/metals, and 3-D design. “We have been able to do this at Iowa because art and engineering faculty have been pursuing a first-of-its-kind curriculum called the Art and Engineering Track,” McGuire says. Since the class started five years ago, more than 70 students have built bicycles, and seven have gone on to be engineers and craftspeople in the bicycle industry, he says. The class is helping put UI on the map in a new and unique way. The class presents a unique opportunity for students to master skills, such as welding, that are not part of many other classroom experiences. It’s also a chance for each student to create an aesthetic and functional piece of equipment from start to finish. Jenna Kolberg, a senior majoring in industrial engineering with a focus in design and manufacturing, says the class has been a good learning experience and one in which she was able to apply many engineering principles. The steel frame of her bike will be painted lime green, inspired by the volunteering she’s done for UI Dance Marathon. This will be her first time showing at NAHBS. Billy Cho, who has taken the class three times, will show a titanium mountain bike this year—his second at NAHBS. Through connections made there, Cho has been offered a job working for Black Sheep Bikes in Fort Collins, Colorado, after he graduates. The second-year graduate student earning his M.F.A. in ceramics says he hasn’t yet decided if he will accept.